Clear your home of all scissors and other sharp objects that could be fashioned into scissors. A woman with scissors in her home is like an alcoholic in a bar. 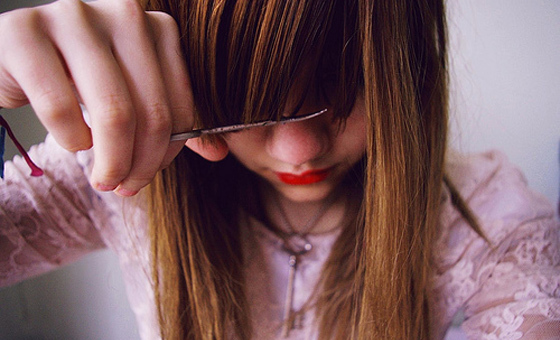 If there are people in your life who cut their own bangs, cut them out of your life immediately. They may draw you in with their rough-and-tumble charm, funky DIY look, and reckless abandon, but these people are not helping you. Waiting too long to schedule your hair appointment is a gateway to cutting your own bangs. If you expect to live in your current city for the next five to ten years, book appointments every month for that duration. Get away from temptations like mirrors and fashion magazine images of Zooey Deschanel. Go out for a walk, run, or other non-bangs involving activity and you’ll instantly feel calmer. Scream or punch a pillow, if you’re bangs are really getting to you. Journal about the urges you’re having. Once you have an enduring, external sense of support, you can transcend your destructive desire to cut your own bangs and transform that anxiety into a state of fearlessness, becoming a woman who makes smart, secure hair decisions. Don’t Trim Your Bangs – NO MATTER WHAT! 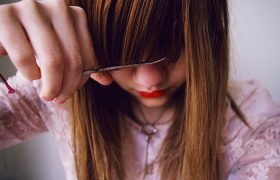 Whatever it takes to avoid the deadly mistake of trimming your bangs – do it! Have a responsible, bang-possessor that you can call in your darkest hour. Remember: bangs should always be cut by a professional stylist. Don’t go it alone!